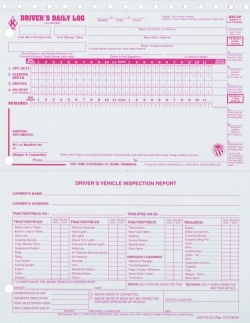 Carbonless Imprinted 2 in 1 Driver's Daily Logs 2-ply Carbonless Recap Detachable Detailed DVIR Loose-leaf 605-FS-I2 is a 2-Ply Loose-leaf Format log sheet that has a Detailed Driver's Vehicle Inspection Report (DVIR) printed on the front which is perforated for easy removal. This log can also be used for compliance with DOT's Hours of Service Rule. The log sheet has a recap. NOTE: Imprint orders are not returnable unless we have made an error. Please allow approximately 5 - 6 weeks for your order to be processed. Imprint log book orders are subject to a 10% overrun and charge. This overrun is a printing industry standard. The overrun quantity and charge will be added automatically. 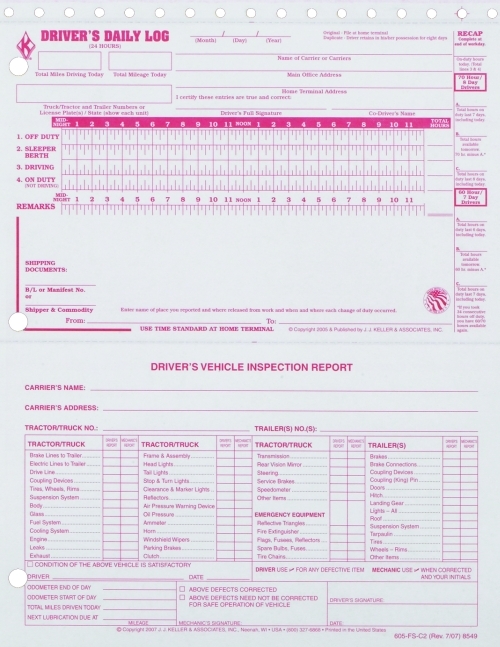 Please see Imprinted Log Books standards section of Frequently Asked Questions for more information.